nature finds ways to intrude into our lives. A good friend recently turned up with odd welts and itchy bumps on their hands. Their first guess was that they had a reaction to touching the sticky syrup on mangoes. The sticky sap on mangoes can act like poison ivy, causing such reactions in some people. When the reaction goes away, we tend to forget about it … unless it is scabies – and doesn’t go “away”. Scabies is a skin reaction due to an allergy to small mites. Scabies produces small red bumps and blisters. 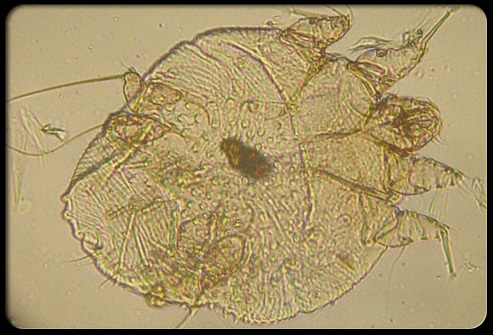 The mites that cause scabies feed on humans, burrow into the skin, and deposit their eggs (maturing in 21 days). The burrows look like a pencil mark. The burrows are tiny and threadlike, between 2 mm to 15 mm long. They look like thin gray, brown, or red lines. <= Here’s a picture of the allergic reaction, the burrows, and infected pus points from scratching. Scabies is generally spread by skin-to-skin contact with another person who has scabies (mites). The Pets and animals cannot spread human scabies, because the Sarcoptes scabiei mite is specific to humans. Because the mites are killed by hot water, bleach, free chlorine in swimming pools, detergent, etc: scabies (mites) are generally not spread by either laundry, sheets, towels, or swimming pools. Mites are basically cousins of spiders that are so tiny that they are not visible to the human eye. Just like spiders pop-up in our homes, mites can creep into our lives. The person shown above has what is called “crusted scabies”. 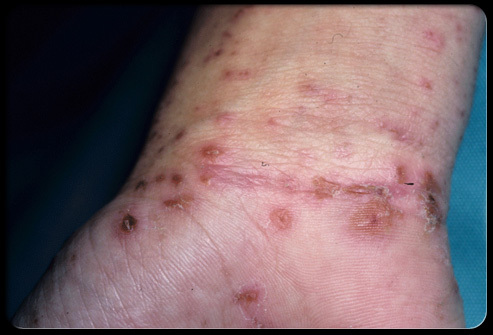 “Crusted scabies” is a form that can transmit the scabies mites to another person through skin to skin contact. Itching is the most common symptom, but symptoms may not appear for as long as two months after being infested scabies mites. Infested people are able to spread scabies during the time of no symptoms. The friend with the scabies mites got the itch again two months ago. The “mango syrup reaction” lasted longer this time, though. When they a good look at the parallel tracks on their hand… Bingo! The light bulb went on and they knew what it was. Scabies! This person had seen scabies in the lab and realized the tell-tale tracks and the incessant itching needed treatment. Why get treatment? Since we humans often have low level Staph Aureus living on our skin (and sometimes Streptococcus), scratching the bumps breaks the skin and injects staph, causing secondary bacterial infections (including impetigo: yellow pus). NIH PubMed Impetigo – Skin Infection Reference A doctor at the CMA in Progreso had prescribed Eurax (Crotamiton cream) to the patient for their previous scabies mite infestation. They still had their Crotamiton tube, used the whole thing, and thought the scabies were gone. … A few weeks later the itch came back. It was so bad that it made sleeping difficult – practically drove the friend nuts. After some on line research, they bought Ivermectina tablets, which seems to be working. Since we are not physicians, just allergy patients who have been around the block with these sometimes maddening effects, we do not offer any of this as advice for diagnosing nor for treatment – just sharing the stories of a good friend about some of the things that pop-up here in the Tropics. For difficult cases, some health care providers may also prescribe medication taken by mouth to kill the scabies mites. Ivermectin is a pill that may be used. Itching may continue for 2 weeks or more after treatment begins, but it will disappear if you follow your health care provider’s treatment plan. You can reduce itching with cool soaks and calamine lotion. Your doctor may also recommend an oral antihistamine. Calle 7 No 215A Col. Garcia Gineres – 2 blocks west of Centro Chevy/Av. Izaes – North side (on your right) – several blocks before ISSTE. Disclaimer: This information is not meant as medical advice. It is for educational and informational purposes only. Medical problems are best diagnosed by a good physician. See professionals for advice on important issues. What oral Madecine is recommended fir a 14 years old boy ? NIH reports Ivermectin, but believes it is good to use cremes like permethrin or crotamiton first. Thanks for posting this. I got this condition while traveling the Sacred Valley in Peru. It really is hell! I was miserable for months trying to cure it.